I am just extremely busy this month ( well who is not ) . Sigh .. Being an Accountant by professional , this month is a crazy month given is Australia End of Year reporting. Honestly, things should not get that bad but is the start of winter too. Winter is NOT my kind of weather . Australia winter is too dry , too icing cold even when we have sun around us. You do not feel any warmness. The winter start of with rain , wet and strong wind. Just make thing a little bit difficult for me. I should not be complaining anymore , June is going to over and I just need to get more use to this . Rice Dumpling festival fall on 12/06/2013 this year. ( Is a Chinese Festival so it goes according to Lunar calendar) . I promise myself I will do my best to celebrate ALL Chinese festival even I am in Australia. So here is it, my happy rice dumpling experience this year. There are so many recipes on the internet, I realised that is so many style even with the same style the result for each one of us will be different. The reason is you are going to do a style that is from your family . I would say Rice Dumpling is indeed a family dish , the way you did it probably is the way your mom did it. Your mom surely got her recipe from her mom and needless to say , grandma got it from her mom too ^^. Hence this make the rice dumpling so special for each one of us. My mom did not do Nyonya Rice Dumpling ( as we are not Peranakan ( Nyonya)) so I got the recipe from the internet ->Annielicious . However I make some changes. I cannot find any blue flower in Australia, basically not sure how it looks like and where can I get it I do not bother myself too much to find it. I add pandan essence into my rice and make it the "green" version instead of the blue version. The result still great, it make the smell of pandan stronger in the rice dumpling and I omit the part that put a pandan leaves in the rice dumpling while wrapping it. 1. Soaked glutinous rice overnight , till water come out clear. 2. Mixed the lye water into the glutinous rice , till the rice change to yellowish color. Be ensure all the rice is mixing well as too much of lye water will have a taste of bitterness in the rice. So do not use too much of it. 3. 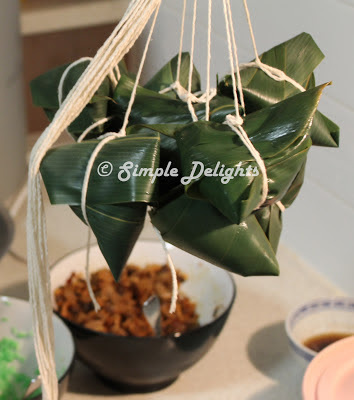 Wrap the rice dumpling as per the link ->Table for 2 or more. She show a very good video in how to wrap rice dumpling. 4. The portion to for this rice dumpling, place 1/2 tbsp of rice into the leaves and 1 tsp of red bean then top with 1/2 tbsp of rice.It really depend no how big/small your leave is. 5. Tie the rice dumpling well and boil it in hot water for at least 2-2.5 hours. I make a mistakes , I thought such small rice dumpling need not to boil for that long , so it turns out the inside part of my sweet rice dumpling is not thoroughly cook . I realised once the rice dumpling is undercook is hard to get it cooked through even if you put it back to the pot to re boil . So make sure it is done well the 1st round. As for my Bak Zhang - meat rice dumpling , the recipe is from my mom . I simply love it the way she did cause is family food. So I will share the recipe is some other time as family recipe is always goes with your gut feelings , we do not have exact measurement. I got to work it out . Nyonya Rice Dumpling and 59 Cantonese Style Rice Dumpling. One of the friends love it so much , beside what was given to them , they bought the extra dumpling from me. Some suggest that I do more and they want to place order from me. They simply love it ! I guess the different from what is selling outside compare to what I did, is the way a family will make it for their close one. Chinese Pan Fried Chive Pork Bun ( 韭菜猪肉煎包）.